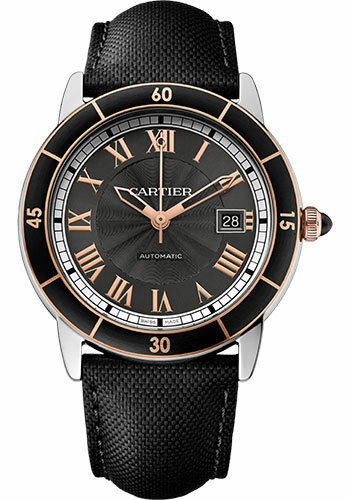 42mm stainless steel case, 9.7mm thick, 18K pink gold fluted crown set with a black synthetic spinel cabochon, pink gold-plated steel bezel with ADLC coating, sapphire crystal, gray dial with pink gold-coloured Roman numerals and pink gold-coloured sword-shaped hands, caliber 1847 MC self-winding movement with calendar aperture at 3 o'clock, black calfskin strap, double adjustable folding buckle. Water resistant to 100 meters. 42mm stainless steel case, 9.7mm thick, fluted 18K pink gold crown set with a black synthetic cabochon-shaped spinel, pink gold plated steel bezel, sapphire crystal, gray dial with gold finish appliques and gold-finish sword-shaped hands, automatic movement, stainless steel bracelet. Water resistant to 100 meters. 42mm stainless steel case, 9.7mm thick, fluted crown set with a black synthetic spinel cabochon, ADLC-coated steel bezel, sapphire crystal, silvered dial with steel black sword-shaped hands, caliber 1847 MC self-winding movement with calendar aperture at 3 o'clock, black calfskin strap, double adjustable folding buckle. Water resistant to 100 meters. 42mm stainless steel case, 9.7mm thick, fluted crown set with a black synthetic spinel cabochon, ADLC-coated steel bezel, sapphire crystal, gray dial with steel black sword-shaped hands, caliber 1847 MC self-winding movement with calendar aperture at 3 o'clock, black calfskin strap, double adjustable folding buckle. Water resistant to 100 meters. 42mm steel case, 9.7mm thick, fluted crown with a black synthetic cabochon-shaped spinel, sapphire crystal, gray dial with Roman numerals and blued-steel sword-shaped hands, caliber 1847 MC self winding movement with calendar aperture at 3 o'clock, steel bracelet. Water resistant to 100 meters.